The Chicago Blackhawks organization and fan base endured an emotional weekend. The NHL Entry Draft, hosted by Chicago for the first time in history, was supposed to take center stage. For many, it quickly became an afterthought as general manager Stan Bowman made two trades that will re-shape the team’s 2017-18 roster. In a matter of hours, Niklas Hjalmarsson’s and Artemi Panarin’s tenures in Chicago came to an end thanks to back-to-back blockbuster trades that will take some time to digest, particularly in the case of Hjalmarsson. 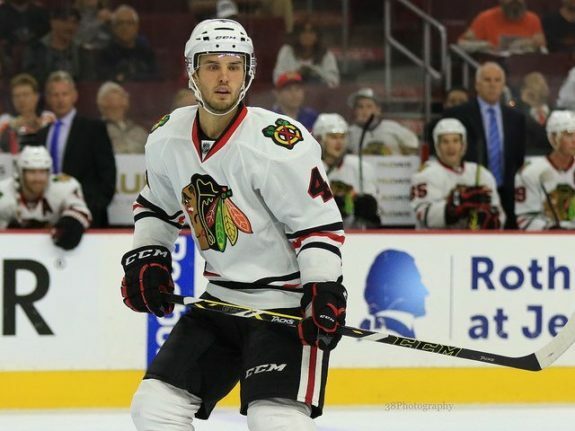 Hjalmarsson, sporting a $4.1 million cap hit over the next two seasons, was traded to the Coyotes in exchange for NHL defenseman Connor Murphy and NHL/AHL center Laurent Dauphin. Hjalmarsson was not one of the core players I expected to be traded this offseason, although there were some rumblings that such a move could occur. This trade was not about becoming a better hockey team when the Blackhawks take the ice on October 5th against the Pittsburgh Penguins. Bowman pulled the trigger on this transaction with the long-term goal of becoming younger and cost-controlled while still giving the current roster an opportunity to compete for a championship. To that end, losing a 30-year-old, three-time Stanley Cup winning defenseman hurts the Blackhawks’ cause. So, what did Chicago gain? Murphy is a 24-year-old, American-born defenseman that signed a six-year, $3.85 million AAV (average annual salary) contract prior to the 2016-17 season. He was selected by Arizona 20th overall in the 2011 draft despite nursing a serious back injury during the year or two prior. At 6’4″ and 212 pounds, he is comparable in size to Brent Seabrook. The Blackhawks are going to need a smart, physical and defensively responsible game from Murphy. The talent around him will be an upgrade from his time in Arizona, and it’s fair to expect continued growth in his game. And what about Dauphin? 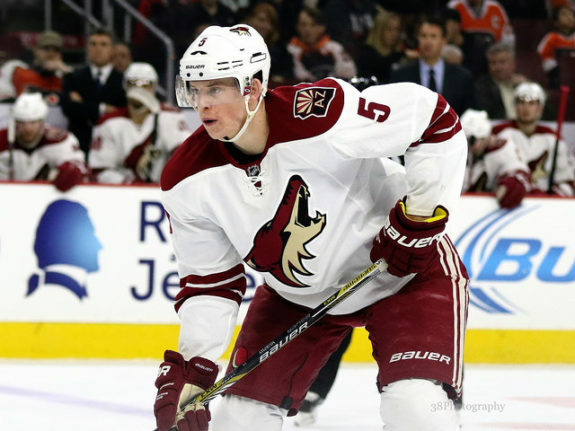 He was drafted 39th overall in 2013 and has split time between the AHL and Coyotes over the past two seasons. As a prospect, he was touted for his terrific shot and tenacity but wasn’t considered the strongest of skaters. During 2016-17, he recorded 28 points in 38 AHL games but only 3 points in 24 NHL contests. I wouldn’t be surprised to see him start in Rockford, although he will likely get a fair shot to compete for an NHL roster spot at the Blackhawks’ prospect and training camps. This will be a big year for the 22-year-old center, as he is on the last year of his entry-level contract. His cap hit, if on the NHL roster, will be $745,000. He has the potential to earn $82,500 in performance bonuses. 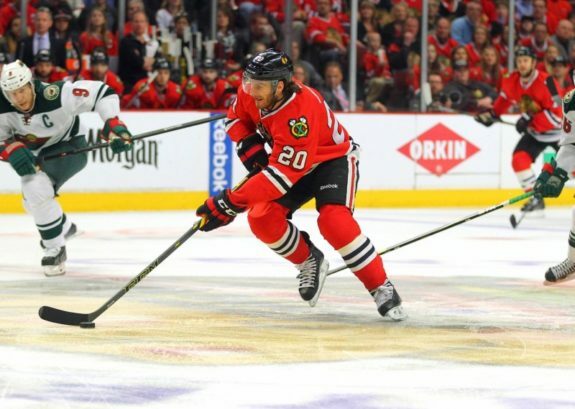 As hard as the Hjalmarsson trade was to swallow, the return of Brandon Saad to the Chicago Blackhawks is a terrific move by Bowman. As I recently wrote, Saad is the best forward not named Jonathan Toews or Patrick Kane to be drafted by Chicago in the 21st century. Sure, losing Panarin and a top-15 scorer could negatively impact the Blackhawks’ offensive output next season. But, Saad is no slouch. He has established himself as a 50-point player and brings a better all-around game to the rink. At 24, he is also a year younger than Panarin despite heading into his sixth NHL season and already winning two Stanley Cups. Financially, the deal was a wash in the short-term. Both players have a $6 million cap hit during the 2017-18 season. The difference? Saad is controlled at that cost for four more years, twice as long as Panarin. If he maintains his current scoring pace, Panarin will command a long-term contract of greater than $6 million AAV, something the Blackhawks may not have been able to afford. Ancillary parts of the transaction included forward prospect Tyler Motte and a 2017 sixth round pick to the Columbus Blue Jackets in exchange for goaltending prospect Anton Forsberg and a 2018 fifth round pick. Forsberg is a restricted free agent, but I presume Bowman has full confidence that he will bring the young goalie under contract for the upcoming season. Forsberg should have every opportunity to become Corey Crawford’s backup. These trades reduced the Blackhawks’ projected 2017-18 cap hit by $250,000 and therefore had more to do with roster composition and long-term financial certainty than they did with short-term cap relief. Namely, Bowman was trying to find a top-line, two-way winger in light of the Marian Hossa news as well as a backup goaltender. But, we know there’s more change to come. 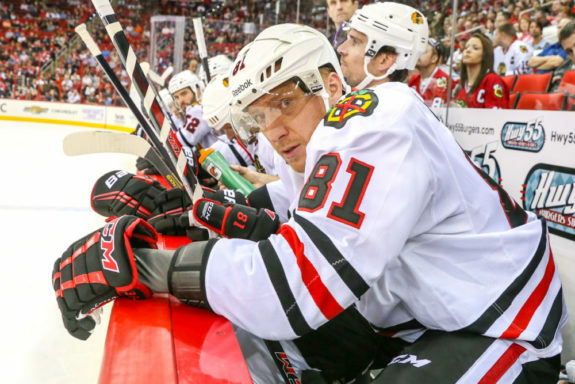 The Hossa factor will continue to linger over Bowman’s roster decisions leading up to and through the 2017-18 season. Removing him from the roster count, as he will be sidelined for the 2017-18 season, puts the Blackhawks at 20 players. Additionally, Chicago will be able to exceed the $75 million salary cap by the amount of Hossa’s $5.275 million cap hit. But, the details are complicated. The most critical element is whether the team decides to replace Hossa’s salary and roster spot before or after the season begins. If Bowman wishes to do so before the season starts, the Blackhawks can head into opening day with a cap hit of no greater than $80.275 million. In doing so, though, Hossa is considered replaced and the Blackhawks will not have additional roster flexibility related to Hossa’s LTIR status during the season. The other option would be to replace Hossa during the season. In that scenario, Chicago would have to enter the season at or under the $75 million salary cap inclusive of Hossa’s cap hit. Then, during the season the Blackhawks could make a roster move to incur an additional player(s) with a total cap hit up to $5.275 million over the $75 million ceiling. If the Blackhawks stand pat and elect not to move any more players off of their roster, Hossa’s LTIR status should give them $3.825 million in cap space to fill three roster spots. That could be achieved through unrestricted free agency beginning on July 1, signing restricted free agents (some of whom they’ve tendered offers to) or moving signed prospects up to the NHL roster. Marcus Kruger’s situation is another decision for Chicago’s front office. At this juncture, many expected Kruger to have been moved as part of the expansion or entry draft processes. Alas, he remains. That is likely because Kruger is due a $2 million signing bonus on July 1. While he may move, it likely won’t be until after that date. Should Kruger and his $3.083 million cap hit be moved, Chicago would then have $6.9 million in cap space to add four players. That should give Bowman plenty of flexibility. Depending on how they wish to utilize LTIR, they could go into the season prospect-heavy and look to replace Hossa’s cap hit with a big trade prior to the deadline or sign a difference-maker or two in the offseason. At least the club will have options. It’s also conceivable that another player or two could still be on the move. Artem Anisimov would be the likely candidate. His contract and production would be palatable for potential trade partners. Moving Anisimov, depending on the return, could give Chicago up to $11.5 million in cap space to then fill five roster spots (assuming Kruger departs). Free agency starts on July 1. I don’t expect the Blackhawks will factor into any big signings, but the process will start to round out rosters around the League as we move deeper into the offseason. After the free agency period passes, the next event to look forward to should be prospect camp. Typically held in mid-July, the details on that camp should be released soon. Given the increasing amount of young talent in the organization, this camp may prove to be a little more interesting and important than in the past. It should be the first step for players like Jan Rutta, Alex DeBrincat, David Kampf, newly-acquired Forsberg and Dauphin, Graham Knott and others to make an impression on the Blackhawks’ coaching staff. Training camp should start in mid-September. 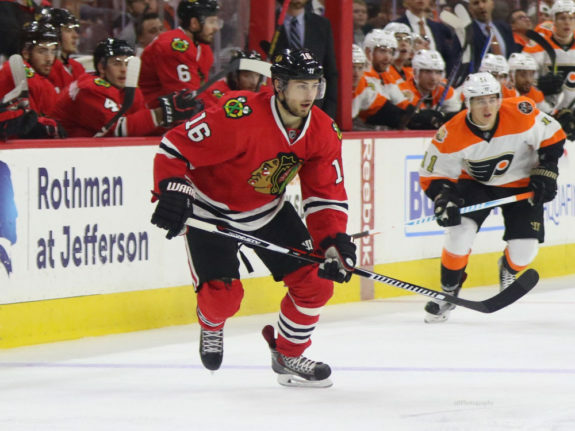 This may also prove more critical than in past years, as head coach Joel Quenneville and his staff will be trying to integrate a lot of new names into a team that still has Stanley Cup aspirations.